The wood wine gift box displays a 1" scale vignette with a view of the vineyard. The left side features the Tuscan stucco wall with window grate, beams, and vineyard view. 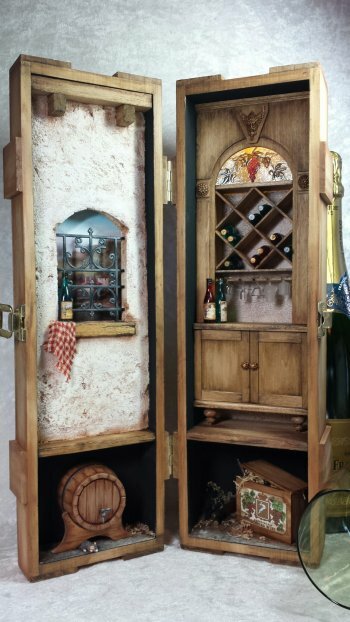 The right side includes the wood wine cabinet which features a Bacchus medallion, faux stained glass window, and a wine bottle kit for 6 bottles. 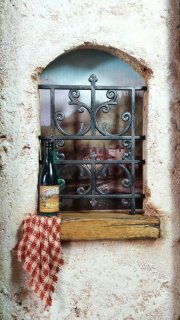 The grape themed arched window can be lit from behind to give a soft glow to the scene. The wine crate kit and wine cask kit with tap and base are included. The closed gift box measures approximately 13.5" H x 4" W x 4" D with a width of 9" when open.